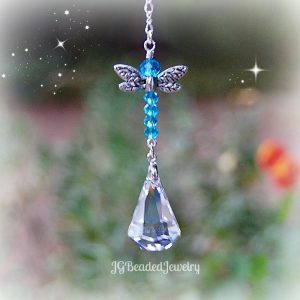 This hanging prism black Swarovski crystal beaded decoration is unique and designed using a quality 20mm faceted crystal ball that is wire wrapped by hand for quality, strength and longevity! It is embellished with gorgeous vitrail/clear faceted glass beads, flawless black Swarovski crystals and fancy silver metal beads. 1) Rearview Mirror – a silver chain with clasp. 2) Window/Home Decor/Garden/Porch/Etc) – a 6″ chain with ring to hang in a window. 3) Fan/Light Pull – 6″ silver ball chain with connector for easy attachment. If you would like more than the quantity available or perhaps in a different color, please contact me and I will respond as soon as possible.